At FCVC we know that you can get pets from many places. We have added the Adopt-A-Pet Search widget right on our site! 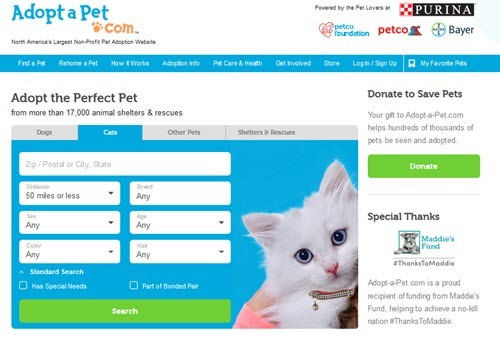 While we are talking mostly about cats this month, Adopt A Pet.com is for dogs, cats, horses, rabbits and other critters. This is in keeping with our support of rescue groups and shelter that have many cats, dogs and other species of pets that need good homes. Maybe even at your house! Give the Adopt-A-Pet Search a try and see what pets are waiting for you today. We would love to see your new pet, too! If you missed them we have some great articles that can help you think about what kind of pet you might like to get (Ten Things Every Cat Owner Should Know) and the steps to getting your new pet from a rescue or shelter (Adopt A Cat or Dog & Adopting – How It Works) and then what to do when you get them home (Choosing and Caring for Your New Cat). We have lots more articles on dogs and cats on our We talk Pets blog.